George Washington’s Sacred Fire–For years, teachers, and many historians proclaimed George Washington a mere deist, a term referring to a vague notion of God off in the cosmos somewhere having little personal interest you, me, or George Washington. That notion was smashed in 2006, by author Peter Lilliback. Peter worked for about 14 years compiling a nearly 1200-page book that includes virtually everything George Washington ever said or wrote regarding his spiritual beliefs. The bright light of the author’s research exposes with abundant clarity that the public and private life of George Washington was overwhelming driven by his faith in God. It’s a relatively long book that can be read the usual way or you can readily select from the table of contents the portions that interest you. 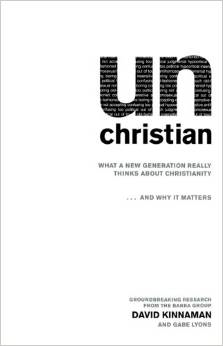 Unchristian–The Barna Group has been conducting surveys on topics of interest to Christians since the early 1980s. David Kinnaman is a senior Barna Group staffer. In 2007, much of their recent research was assembled in David’s seminal book. With laser-like clarity, his book documents the widespread drift of Christians from the Biblical worldview, the flight of Christians from the churches, especially young adults; and the resulting cultural chaos that followed. When interviewed, one young 20-something girl said simply, “The church no longer looks like Jesus.” She likely had no idea that her statement was so profound. Unchurched is an easy read and a startling eye-opener. For God or for Country: When Nations Deny God’s Natural Law—Years ago, Walid Shoebat was a Palestinian terrorist. He became a Christian, after a young woman asked him several questions he could not answer. The answers to the questions inspired his conversion and later marriage to the young woman. With the help of Walid’s grown son, he wrote the book in which he traces virtually all the world’s political, economic, and religious systems back to the plain of Shinar, the Biblical site of the Tower of Babel. Of course, the clear exceptions are Judeo-Christian tradition and American-style democracy. Along the way, the author demonstrates that the millennia-long drift from the Biblical worldview is responsible for the worldwide malaise today. 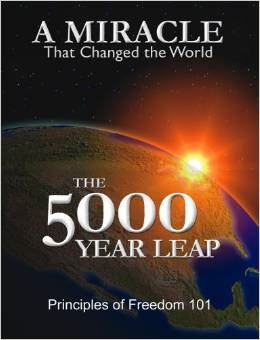 The 5000 Year Leap: A Miracle that Changed the World—In recent decades, it seems to have become open season on America’s Founders. They have been imaginatively vilified in numerous ways. However, a common sense reading of what they said and wrote, instead of what others wrote about them, clearly reveals their uncommon wisdom that was honed in the crucible of debate, during the writing of the Declaration of Independence and the U.S. Constitution. The book subtitled, Principles of Freedom 101, is exciting and a very easy read; it builds upon the basic concepts in the U.S. Declaration of Independence. The Declaration stipulates in part, “they are endowed by their Creator with certain inalienable rights, that among these are life, liberty, and the pursuit of happiness.” The author, W. Cleon Skousen, notes that “among these” infers other rights that are self-evident and God-given, not government granted. Altogether, there are 28 principles of freedom refreshingly illustrated in the book. 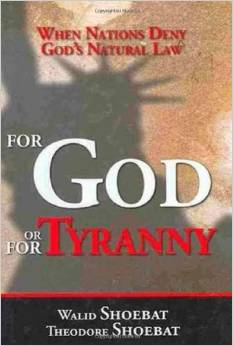 This is the book President Ronald Reagan wanted taught throughout all the nation’s schools. 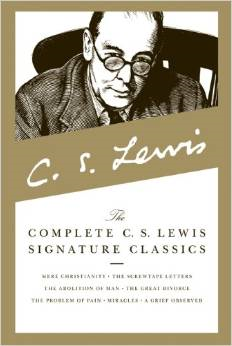 The Complete C. S. Lewis Signature Classics—In 2002, C. S. Lewis’ most popular and brilliantly written works were compiled in a single volume. It includes, Mere Christianity, The Screwtape Letters, the Abolition of Man, The Great Divorce, The Problem of Pain, Miracles, and A Grief Observed. Although Dr. Lewis passed away in 1963, his books read like they could have been written yesterday and sales continue to outpace most recent books. His Biblical worldview is clear and plain. His writing can be a bit challenging at times, but it is definitely worth it. How Should We Then Live: The Rise and Decline of Western Thought and Culture–Like many younger students in my school days, I had a mental pigeon hole for each subject. I filled my brain during the semester, crammed for the final exam, and spilled that knowledge all over the exam paper, seemingly promptly forgotten days later. In his history of western civilization, Dr. Francis Schaeffer shows how God is the mortar that holds the entire body of knowledge together in a unified whole. Don’t panic! The book is only about 270 pages long. With a young, soon to be engineering mind, I was baffled when an art teacher asked me about the meaning of a painting. I looked at a painting and either liked it or not. The whole idea of meaning escaped me. 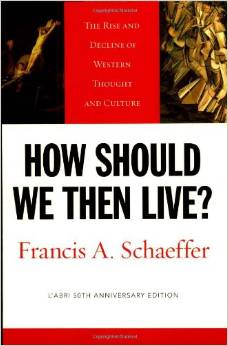 But in Schaeffer’s book, he displays a Rembrandt painting entitled, Raising the Cross. The picture shows the Roman soldiers in the act of raising the cross, with Christ nailed to it, to the vertical position. It resembles the iconic photo of the marines raising the flag at Iwo Jima. In Rembrandt’s picture, he painted a self-portrait among the Roman soldiers, effectively saying that my (Rembrandt’s) sins nailed Jesus to the cross. Never again will I question the meaning of a piece of art. Thank you Dr. Schaeffer. This book is an important read for everyone of Judeo-Christian tradition. 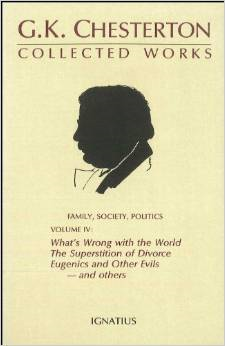 G. K. Chesterton-Collected Works Volume IV—The 1987 publication assembles several of Chesterton’s best known works, including, What’s Wrong With the World, The Superstition of Divorce, Eugenics and Other Evils, Divorce Versus Democracy, and Social Reform Versus Birth Control. Anyone who has been a Christian for more than a short time is familiar with the works of Dr. Francis Schaeffer and Dr. C. S. Lewis. But for years I wondered about the occasionally encountered quotes by Chesterton and Abraham Kuyper. My investigation revealed the Chesterton and Kuyper were the Schaeffer and Lewis of the first quarter of the 20th Century. Although Chesterton’s writings are about 100 years old, they read as fresh as today. C. S. Lewis said that for every new book we read, we should read three old ones. Chesterton’s book certainly qualifies as one of the old ones and is a must-read for today’s Christians. The Battle for the Beginning: Creation, Evolution, and the Bible—John MacArthur’s 2001 book acknowledges that people desiring to discredit the inspiration of the Bible often attack Scripture by attempting to cast doubt on the Book of Genesis. John persuasively argues that most New Testament doctrines are rooted in Genesis and that if Genesis does not factually represent ancient history, the whole New Testament falls apart. For example, there have been many attempts to present the story of Adam and Eve as an allegory or identify them as symbols of a longer creation process. But the New Testament declares that by one man (Adam) sin came into the world and by one man (Jesus) mankind is freed from sin. If there was no literal Adam, then there was no original sin and the death of Jesus on the Cross has no meaning. Clearly, there was a literal Adam and Eve. The Book of Luke even provides the specific genealogy of Jesus going all the way back to Adam. It is not possible to trace a genealogy back to an allegory or a symbol. 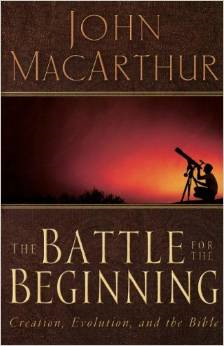 MacArthur’s outstanding work is a great read. 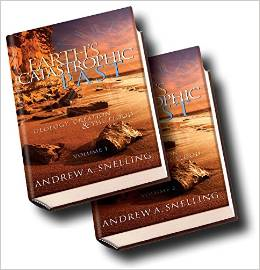 Earth’s Catastrophic Past: Geology, Creation, & the Flood—This two-volume set by Andrew A. Snelling, Ph.D. (2009) provides about 1100 pages of carefully researched scientific evidence supporting the Biblical accounts of creation and the worldwide flood at the time of Noah. Whew! That’s a lot, but it is a great read for anyone interested in the topic. 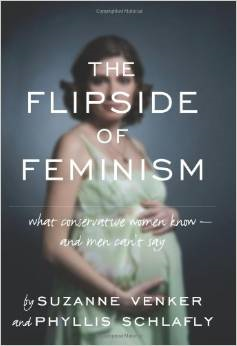 The Flipside of Feminism: What Conservative Women Know and Men Can’t Say—Suzanne Venker and Phyllis Schlafly (2011) brilliantly present the rarely heard but powerful negative effects of feminism on the culture and the family. At the end, she offers A New Roadmap for Women.